Back in 2010, people started an ambitious project to bring the wild European bison (Bison bonasus), also known as wisent, back to Germany. After a 3-year transition phase, the first wild European bison roamed Germany again. Attempts of a European bison from Poland to settle on German territory ended up in authorities shooting the European bison. The reintroduction project became a success. Conservationists managed to transport a European bison herd of eight animals to the German region of North Rhine-Westphalia. The European bison herd has grown, and forest farmers are demanding control. Last month, politicians, conservationists and forest farmers agreed on a compromise to fence the wild European bison in on a 1 500 hectare area. Please also read: What does tourism do for wildlife conservation? The discussions between forest farmers, conservationists and politicians has been going on for the last years. Recently the provincial Minister of Environment of North-Rhine Westphalia met with the other groups to find an interim solution. After the first year of reintroduction, the wild European bison herd produced a lot of young European bison. According to the latest estimation, the herd has now 20 individuals. The herd’s initial territory, Rothaargebirge, is a forest territory of Prince Richard, the 6th Prince of Sayn-Wittgenstein-Berleburg. However, some animals started to wander from the Rothaargebirge into the neighbouring forests of Sauerland. Two forest farmers there were not happy with this, as the European bison ate from their beech trees. Since then, the forest farmers tried to stop the conservation project. A special fund covers the forest damage in Sauerland, yet this was not enough for the forest farmers. As a result, a legal fight followed for many years in court. Attempts to mediate failed time after time. In fact, the case ended up in the Higher Regional Court, which judged the European bison as wild animals. Forest farmers have to tolerate the wild animals. However, the conservationists also have to install appropriate measures to prevent European bison damaging other forests. The consequence would be that the European bison are put behind a fence, conflicting with their ‘wild’ status. The compromise between forest farmers, conservationists and politicians is now to install a permeable fence. The fence would allow smaller animals to cross, as well as humans. Yet, European bison are not able to cross the fence. At first, conservationists will try to initially lure the wild European bison back into the designated 1 500 hectare area with food. This is already happening this year. Furthermore, an independent report will be made to make a final decision on the future of the European bison conservation project. Following this, the final decision will take place within the next three to five years. More and more, we notice the tendency where people want to control wild animals again. Using sometimes traditional techniques, combined with new technology, people want to control everything. As an example is the tendency to collar all wolves. It is not a new tendency, people always want to control their surroundings. The question is how long we continue to let ourselves do so, while disrupting and destroying the last wildest places on our planet. Looking at other examples where large herbivores remained within a fenced area, this interim solution might be doomed to fail. The best example is the Dutch Oostvaarderplassen. In this fenced area, herbivores had unlimited opportunities to grow and expand without natural control. Big predators such as wolves were not able to bring natural balance in the local system, as they could not access the perimeter. As a result, the number of herbivores grew beyond proportion and consumed practically all vegetation. After many protests, this led to additional feeding in harsh times and climaxed with culling of thousands of animals. If Germany keeps their former wild European bison in a closed area where they can grow, at some point the population will be too big. What is next, are we going to kill the bison? Are we letting them starve of ‘natural death’ because of lack of food? Do we start with additional feeding programmes? Or are we capturing European bison and transport them elsewhere to move the problem to another location? It is of crucial importance to keep the European bison in an open and dynamic ecosystem, where natural enemies like the wolf can fulfil their important role as ecosystem engineer. Thank you for your comment. To avoid any confusion for our international readers, I’ve updated the terminology of the bison into European bison. the two remaining bisons species are in fact really not related to each other. They share a similar name where the North American Bison is referred to as Bison bison and the European as Bison bonasus. The North American Bison is often called Buffalo even though it is only distantly related to the true buffalo. The Europan Bison Bonasus is typically referred to as Wisent. Going back in time to the late latin era, it is assumed that the word Bison was derived from the old German word Wisund (Friedrich Kluge, Elmar Seebold: Etymologisches Wörterbuch der deutschen Sprache). So in fact we have two animals looking similar, who are not related on a molecular basis with different sizes but sharing a similar name derived from each other. 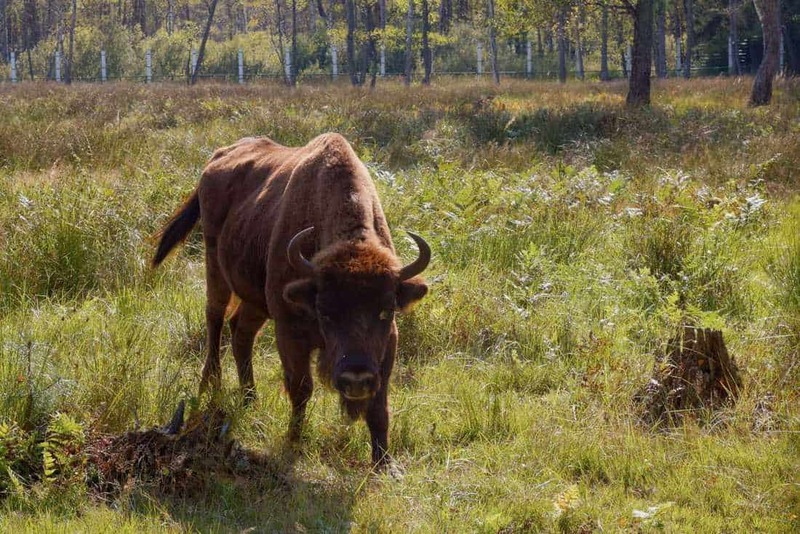 Fact is nevertheless, that we there were several successful reintroductions of the Wisent in Romania and Poland and in Germany, with the notable exception that due to complains by foresters the German Bison Bonasus will now end up behind a fence in a semi zoo of 1500 ha. This will obviously lead to the need to control their offspring by culling to not repeat the disaster of the Oostvaardersplassen reserve. It looks like a nature conservation project ended up as a wildlife safari park for trophy hunters. What a lost chance to have these fantastic animals contribute to the rewinding of Europe.